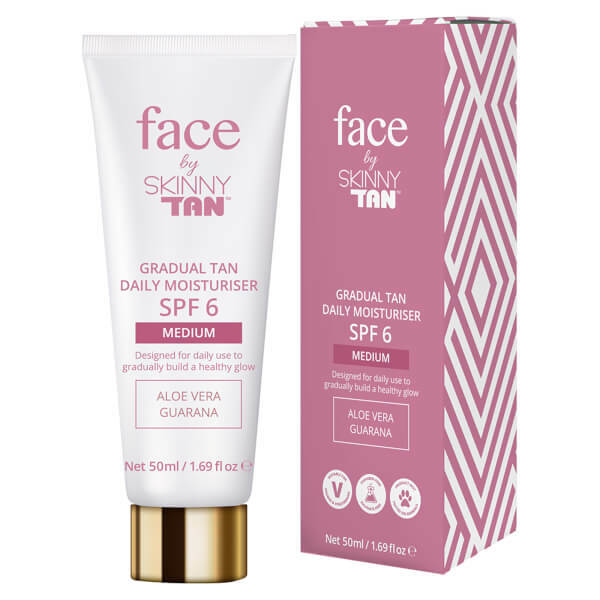 Achieve a natural-looking glow with Face by Skinny Tan Gradual Tan Daily Moisturiser in 'Medium'. The daily moisturiser with SPF 6 protects and deeply hydrates skin while encouraging a healthy-looking colour. Formulated with anti-ageing ingredients, plus Aloe Vera and Guarana, the fast-absorbing emulsion delivers intense hydration while inspiring a gradual tan. Adding warmth and radiance to the complexion, the moisturiser lends skin a glow without the need for makeup, or acts as the perfect base for your usual colour regime. Non-sticky, the gradual tan moisturiser will leave skin looking sunkissed and radiant. Infused with the brand's signature Coconut and Caramel fragrance. 92% Naturally derived ingredients. Suitable for vegans and vegetarians.